No breakfast in bed this morning. There was an F1 GP to be watched. Up and having breakfast in the living room just after 8am. Interesting GP, slightly spoiled by the fact that Leclerc wasn’t allowed to race against Vettel. Come on Ferrari, it’s called a ‘Race’. If you keep protecting spoilt child Vettel, he’ll actually believe he’s number 1 driver. Be afraid Seb, the Russians are coming in the shape of Kvyat. I’m pretty sure he’ll have you in his sights and team orders won’t mean much then. Still a pretty good race. Spent most of the afternoon making preparations for the mid-week, then got fed up and went for a walk in the sunshine in St Mo’s. Got a glimpse of three deer, but not before they saw me. I got a few shots of them, but nothing worth PoD. 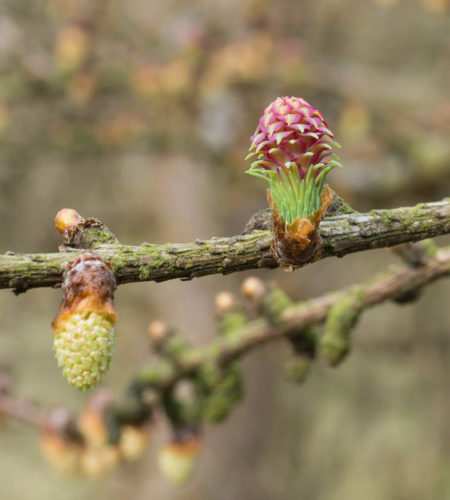 That went to a shot of the male and female flowers on a larch. Such a pretty thing and I only noticed it for the first time last year. We went to the last ever Sunday Social at La Rambla in Paisley. Great food again. Black Pudding with Chorizo in a Red Wine Sauce was the star. Second was the Patatas Gradtinatas. Like I said yesterday, I’ll miss the food, but not the service. Really, four people working the bar with only one customer. One person took the order, passed it over to another who worked the till (after a long consultation with the menu). Meanwhile the first person poured the drinks and the second person took the money. What were the other two doing? It was anyone’s guess. It’s closing soon, no surprise to us. Salsa was well run as usual by Shannon. I must say that for her, she works hard at providing social salsa dancing in and around Glasgow. It wasn’t as busy as we thought it would be, but we did manage a couple of hours dancing which was fine for us. Gems day tomorrow, so I’ll get out of the way.